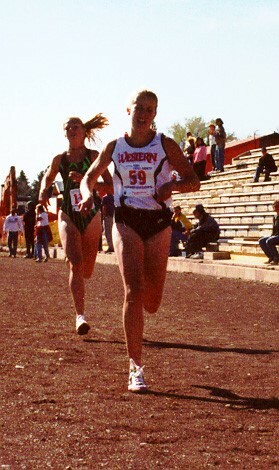 Jennifer Michel, a 1996 graduate of Wheat Ridge High School, was a three-sport letter winner in cross country, basketball and track and field. She started off in volleyball in the fall, but after her sophomore track season when she won the Jeffco meet in the 800 meters, she joined cross country that following fall. Michel competed for two great female coaches- Lisa Berens in basketball and track and Julie Reese of the Running Reese family in track and cross country. In High School, she was all-Jeffco and a state qualifier in the 800 with a best of 2:20, and had a PR of 19:56 in cross country. While she was a good basketball player, she knew she had more potential in running at the college level after being recruited by Duane Vandenbusche at Western State College (now Western State Colorado University). Michel showed real development as a college athlete, where she earned eight All-American honors in track and field and cross country. In track and field, Michel won Division II titles in the 3,000-meter steeplechase, 3,000-meter run and indoor mile, and held the national championship steeplechase record until 2008. She was named the 1999 NCAA DII Cross Country Runner of the Year.